I grew up hearing about the Nazis and how they fueled hatred. But I never thought I would see the same hatred practiced in this country, in the middle of Los Angeles, by a group of people from a foreign country — against an American. My wife, Rosalynn, is of Thai descent but a citizen of America. 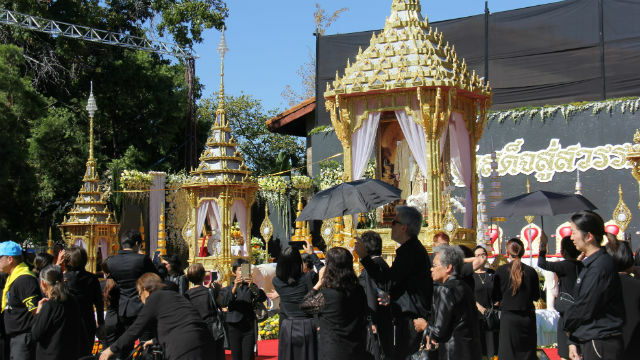 Out of respect for the late king of Thailand, Bhumibol Adulyadej, she and I went to the Wat Thai Temple in Los Angeles on Thursday to pay respects along with Thai people throughout the world as the former ruler of that country, after a year, was finally cremated and laid to rest. At one point, before the ceremony in L.A. as Rosalynn was taking photos of the surroundings, she was accosted by a woman declaring “She is wearing red.” For those who don’t follow the color of politics in that country, red is bad; yellow is good. That’s because the military junta in power the last five years declared it so. My wife’s name is Rosalynn, the longer version of the word “rose,” which, if you know roses, is predominantly red. Thus red is a color she favors. However, she was not dressed in red, but in a tasteful black dress. 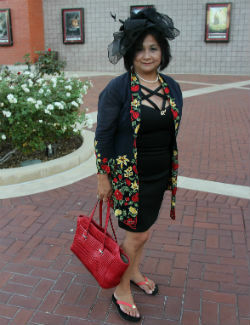 But because the temperature was hot, she chose to cover the dress with a light jacket of red — and yellow — flowers. I might add she had been in the facility for more than an hour and was greeted warmly by several people who know her and who also offered her refreshments. But suddenly, security forces, along with a mob, began surrounding Rosalynn, screaming at her. “Look, she has a red bag,” screamed another woman. Indeed, she did have a red bag. In fact, all her purses and personal bags are red — her color. Then came the accusations: “prostitute” and “whore.” One woman forced herself into Rosalynn’s face. “You are an old woman. Why do you dress like that?” the woman screamed, pointing to Rosalynn’s hat, which is stylish and, I might add, is black. 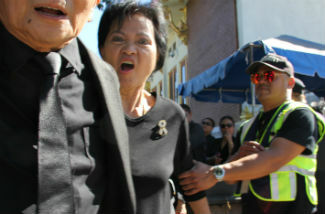 Security with an angry crowd member. There was no misunderstanding the sheer hatred and vitriol against a woman I have always been proud of, for her accomplishments and also for her love of her native country. We have been back to Thailand several times and have written nothing but positive articles about traveling there. One of those articles and Rosalynn’s photos even earned an award from the prestigious San Diego Press Club — an achievement no Thai newspaper or media ever achieved. We have even overseen awards to members of the Thai community for their achievement, and Rosalynn has received commendations from the Thai government — something, I am sure, no one in that crowd ever had. Her accomplishments on behalf of the Thai and Asian community over the years has earned recognition from two American presidents, congressional, state and local officials. “Where are you from?” yelled one accuser. “I am from America,” Rosalynn shot back. “You are in Thailand,” replied one of the security guards, who obviously needed a lesson in geography. “The red shirts sent her,” screamed one of the women, while someone wearing an American flag — in bold RED, white and blue colors — joined the protesters. “Your dress is inappropriate,” declared another woman who tried to get into Rosalynn’s face. The woman was wearing sneakers. “Your hat is inappropriate,” replied one of the security guards, while seated nearby was a man in a U.S. Marine hat and woman in a cowboy hat. We did leave, but that did not stop the threats. We have received close to 1,032 threats attacking both of us on Facebook, obviously fueled by detractors, some of whom were not even there. We have been threatened with death, so we have no choice but to report this to police. And no one symbolized that more than the late king of Thailand, who was known throughout the world for his compassion and understanding. I am certain he would not have smiled on this group of people who came to honor him but instead disgraced everything he stood for. Leonard Novarro is an award-winning writer and two-time Pulitzer Prize finalist. Novarro and his wife, Rosalynn Carmen, founded Asia Media America and the Asian Heritage Society. He is a frequent contributor to Times of San Diego.